It was spring 1979, and we had returned to Dublin after some years in East Africa. Hard to imagine now, but Ireland was going through an unprecedented property boom, and there was that same feverish sense of urgency to “get onto the property ladder” as there is today. Our first son was born two months later and, while renting a flat in Ranelagh, we set about looking for a house to buy. I wanted to stay in D6. Having stumbled across Mountpleasant Square by accident, its uniqueness, its secrecy and the oodles of (then dilapidated) charm, had me hooked instantly. It wasn’t to be anyway. Our life’s savings amounted to £4,000. We made offers on various small Georgian houses but, even with a large mortgage, were outbid each time. Country properties were more desirable then – everyone wanted to get out of Dublin and, as he was a pilot and had to commute to the airport, so did John. Thus we lived in Co Meath for a few years, but I didn’t forget Mountpleasant..
We loved the house of course. A 75ft south-west facing garden not only meant a sunny playground for the boys, but more importantly, evening sun on the patio for relaxed meals after work. Rear access to Mountpleasant Avenue with two shops right beside meant we’d never again have to run out of milk or bread. And there was the sports element: the tennis club in the centre, with its 11 outdoor all-weather courts and its squash/badminton hall, and the Leinster Cricket Club at the back of the house would not only provide us with interest and exercise, but hopefully entice our sons into sports at an early age – as it did. 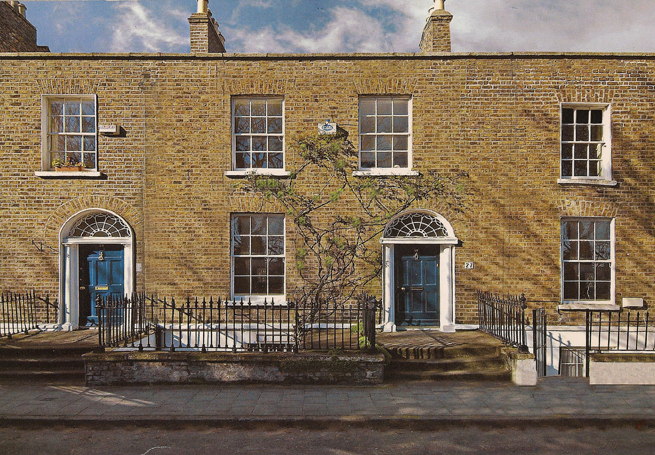 We were surrounded by the best schools and colleges, and whilst Ranelagh now boasts well over 30 fabulous neighbourhood restaurants, in those days the village offered an amazing array of specialist shops. Remember McCambridges delicatessen, with its rows of fragrant spice jars? The all-knowing and all-selling Murphy’s hardware? And the colourful Keegans greengrocers and fishmongers? Needless to say we were seduced. But of course the house was again over-budget. The restaurant deal fell through, yet we chose to take the plunge and make the potentially risky decision to borrow the extra money – NOT to buy carpets or curtains or furniture… in those days you would do without, until you could afford them. John was a freelance pilot in a pre-aviation-boom era and he had already been made redundant once, when AVAIR went bust in 1984. Moreover, mortgage rates were a whopping 17.5 per cent! We had sleepless nights for five years – in case we couldn’t pay our mortgage and would lose the house. But we survived these economically uncertain times. Over the years we restored more than we renovated, as we love the charm of truly original Georgian houses with their elegant tall windows that allow the light to flood in, the exquisitely crafted details, the quality of the materials and the pure, beautiful perfection of it all. There is an active residents’ association that cares enough to have established a well-planned regeneration scheme for the square. As residents, we may think we own these valuable houses but in fact we’re only tenants in a historical square that must be preserved for the future – a romantic view but it has been wonderful to be able to nurture the seeds of appreciation and respect for historic values in our sons (one of whom chose architecture as his profession). A copy of Susan Roundtree’s 1991 Master thesis on urban and building conservation, which is entirely devoted to Mountpleasant Square, is a fascinating source of information and should stay in the house. © Petra Carter 2005 – published in The Irish Times March 24th 2005.